On Monday 3rd October, 2016, twelve exceptional individuals collected a Gold Badge Award from BASCA, in recognition of their unique contribution to music. Crispin Hunt, BASCA Chairman said: “It is a great pleasure for BASCA to celebrate the creativity, inspiration, taste and genius included in this year’s list of Gold Badge Award recipients. Neil visited University of Indiana, Bloomington, to help promote the US premiere of his score to Hitchcock's Blackmail. Neil's next project for BBC Radio Drama is an adaptation of Stevenson's Dr Jekyll and Mr Hyde as a Saturday drama - and no, it won't be anything like the excellent Charlie Higson ITV version! The BBCSO and Barbican Concert Hall are looking to perform Neil's acclaimed concert adaptation of A Christmas Carol next December (2016) - watch this space. Neil's score for Hitchcock's Blackmail has been performed many times in the last year - Lyon's Lumiere Festival, conducted by Leonard Slatkin, the Odessa steps before 25000 people and most recently in Suffolk and Glasgow by the BBCSO and BBCSSO. Asquith’s Underground, with Neil’s full orchestral score commissioned by the BBCSO and Barbican Concert Hall was released theatrically by the BFI throughout the UK in January 2013. It garnered 4- and 5-star reviews in national and local press and will be released on DVD and Blu-Ray in June.. The Wind in the Willows, starring Stephen Mangan, Clare Skinner, Philip Jackson and the BBC Symphony Orchestra was highly successfully broadcast on Radios 3 and 4 and there are plans for another epic radio piece for 2014.. The BBC is commissioning Neil to adapt and score The Wind in the Willows as a concert piece for actors and the BBC Symphony Orchestra, to be recorded for broadcast on Radio 4 and Radio 3 at Christmas 2013..
Neil’s music was highly praised in Michael Eaton’s series of five radio plays ‘Dickens in London’ adapted for film by Chris Newby..
Neil has appeared on BBC1’s The One Show and in two radio documentaries for BBC Radio 4 as well as acting in Mark Lawson’s new radio play ‘The Man Who Knows’ produced by Eoin O’ Callaghan for BBC Belfast. 2012 - an exciting year in prospect for Neil with a new orchestral / radio drama commission, high-profile performances of his hugely successful orchestral scores for Blackmail and Underground and even a new project for BBC TV – watch this space!. Neil was been contracted by the Cinematheque Francaise to provide piano soundtrack to two classic Albatros releases of the 1920s starring Ivan Mousjoukine, Le Brasier Ardent and Maison du Mystere. The recording took place in Paris in September. Neil and Paul Merton performed two live ‘Silent Clowns’ shows this autumn, at the Cinema Museum, Kennington on September 3rd and the Leeds International Film Festival on November 9th. Neil also appeared with the Dodge Brothers at the New Forest Festival on September 18th and Cheltenham Festival on November 3rd. Following the huge success of Blackmail in October 2010, the BBC Symphony Orchestra and the Barbican commissioned Neil composed a new full-orchestral score for Anthony Asquith’s 1928 silent ‘Underground’, which premiered on October 5th 2011. Set in the London Underground and dealing with a love triangle that descends into madness and murder, this film is a wonderful mix of gritty thriller, warm romance and quirky magical realist drama – Virtually unseen for decades because of technical problems with the print, the gorgeous new restoration by the BFI National Film Archive places the film firmly amongst the greatest British silent films and, to my mind, even gives Hitchcock a run for his money. Neil live-recorded his new afternoon musical The Big Broadcast (set in a 30s Chicago radio station) in front of a packed BBC Radio Theatre – the stars were Josie Lawrence and Nigel Harman and the piece was broadcast on June 1st 2011. Neil scored the BBC Radio 4 adaptation of ‘Showboat’ and ‘Paul Merton’s The Birth of Hollywood’ series for BBC4. – see Reviews. There are plans in progress for a new score for October 2011. Neil is being asked to perform regularly at the Cinematheque Francaise in Paris, as well as the Babylon Cinema, Berlin. Neil was selected as writer for an episode of Radio 4’s ‘Fact to Fiction’ season in which a radio play is written and broadcast within a week, dealing with a current news story. His comedy ‘Double Dip’ dealt with the Greek debt crisis. For 2010, Neil was commissioned with long-term writing colleague Michael Eaton to write ‘Waves Breaking on a Shore’, two afternoon plays for BBC Radio 4 dealing with the beginnings of cinema in the East End of London and the impact on the Music Hall of the day and London’s multiracial community..
Neil has had two highly-acclaimed performances playing Loulou (Pandora’s Box) for the Cinematheque Francaise in Paris and the new restoration of Metropolis at the Babylon Cinema in Berlin..
Neil had great success performing twice at 2009’s London Film Festival, once in Trafalgar Square with transport films showing London through the cinema’s eyes, and the following night at the Queen Elizabeth Hall with the Prima Vista Social Club (Gunter Buchwald, Romano Todesco, Denis Biason and Frank Bockius) for a gala Archive premiere of the BFI’s new restoration of Anthony Asquith’s UNDERGROUND (1928). The score was semi-improvised on themes written by Neil to great critical acclaim.. Following his appearances in 2009, discussing silent film music and the score to ‘Vertigo’, Neil has been broadcasting regularly on R4’s ‘Film Programme’ during 2009, analysing famous film scores including Casablanca, Jaws and The Pink Panther. In 2010 he looked back at the work of specific film composers..
Neil had two writing projects broadcast on BBC Radio 4 in December 2009 – a new 45-minute play, Headliner, dealing with the politics of stand-up comedy during an election in an ex-Soviet satellite country, and (with ‘Clare in the Community’ creator Harry Venning) a new six-part comedy series, Sneakiepeeks, about a covert surveillance team.. Following an acclaimed tour of Paul Mertons Silent Clowns in Autumn of 2008 (which was seen by 15,000 people) Paul and Neil were on the road again in April/May 2009. Click here to read reviews..
Neil’s score for the silent version of Hitchcock’s ‘Blackmail’ for 60-piece orchestra for the Bologna Film Festival was performed to enormous acclaim before 5000 people on July 1st 2008, in the Piazza Maggiore by the Opera House Orchestra of Bologna, conducted by Timothy Brock. Plans were made with the BBC Symphony Orchestra for a London premiere in 2010. See separate page..
Neil recently scored ‘The Wrecker’ (1929), directed by Géza von Bolváry, for DVD.. In May 2008, Neil enjoyed a superb collaboration with The Umbilical Brothers in ‘Flicker’ a specially-commissioned show for Cat Laughs Comedy Festival, Kilkenny..
Neil performed his own show in Edinburgh 2008: ‘Neil Brand – the Silent Pianist Speaks’ to critical acclaim. He has since played in London, Orkney, Bath, Tromso, Bonn, Zurich, Inverness and in rural touring venues. See separate page and Forthcoming Events for this year's dates..
His radio play, ‘Seeing it through’ aired on Radio 3 in October 2007 – it is a political drama set against the background of Wellington House, the deeply secret department of propaganda during World War One. See Guardian review.. He recently recorded scores for DVD releases ‘Mitchell and Kenyon in Ireland’, ‘The Open Road’ (BFI, both with Gunter Buchwald), Bluebell Railway No 3 (Bluebell/South-East Screen Archive) and The Life Story of David Lloyd George (Welsh Film Archive). The Silent Britain BBC documentary for which he composed the music is now available through Kino in the States – this DVD is available from BFI Film and Video..
Neil’s score for ‘The Cat and the Canary’ was performed to great acclaim at the New Zealand Film Festival in July 2007. Neil appeared with Paul Merton on Room 101 in March, defending Charlie Chaplin from the wrath of Ian Hislop. For those who missed it, Charlie didn’t make it into Room 101..
Neil is very proud to have had his radio play ‘Getting the Joke’ shortlisted for the Tinniswood Award, given by the Society of Authors and the Writers Guild for outstanding radio drama. The play concerned the trial for obscenity of 80-year-old postcard king Donald McGill..
DICKENS BEFORE SOUND, a DVD of Dickens-related silent material held by the NFTVA and featuring the full-length ‘Oliver Twist’ starring Jackie Coogan was released in August 2006 – scored throughout by Neil it also features textual soundtrack work by writer Michael Eaton and the wonderful Ken Campbell..
SILENT BRITAIN, which Neil scored, is a 90-minute overview of British silent cinema, a subject which has never been approached in such detail before. Containing clips, scenes, interviews and anecdotes the film is a fascinating treasure trove of rarely seen material which will throw some much-needed light on a vanished art form. This has also been released as a BFI DVD..
PAUL MERTON’S SILENT CLOWNS is an opportunity to hear about the great silent clowns from a comedy expert (and comic legend in his own right) who has grown up knowing and enjoying this material all his life – four one-hour episodes deal with Chaplin, Keaton, Harold Lloyd and Laurel and Hardy and each episode ends with a complete short by that artist, scored by Neil. 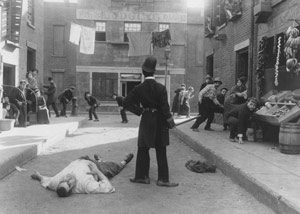 Chaplin’s ‘Easy Street’ is a live improv accompaniment recorded at Bristol Slapstick with German friends (and world-class improvisers) Gunter Buchwald on violin and Frank Bockius on percussion, Keaton’s ‘The Goat’ and Lloyd’s ‘Never Weaken’ are studio recordings featuring great session musicians including Sonia Slany on violin and finally Laurel and Hardy’s ‘You’re Darn Tootin’ has the 10-piece score commissioned by Paul from Neil for last year’s SLAPSTICK, recorded live at Pordenone Festival featuring Dutch and Italian musicians and the trouser-ripping sound effects of the entire audience!!. And finally, his TV adaptation of STAN, the Sony-nominated radio play from 2004, aired to huge critical acclaim – Jim Norton and Trevor Cooper played the older Stan and Ollie and Nik Howden and Mike Goodenough played the younger. The director was Jon Sen. The reviews can be seen on this page..
Neil’s musical, TALKING WITH MR WARNER received its second showcase at the Menier Chocolate Factory with a superb cast in December 2005 after extensive rewrites, again to great critical acclaim. The next stage will be a full production..
Neil has recently recorded piano accompaniments to Schloss Vogelod (Murnau), Spione (Fritz Lang), The Woman Men Wanted (Dietrich), Die Grosse Sprung (Leni Riefenstahl) and When I was a man (Lubitsch) for the FW Murnau Institute which will be aired on European TV and ultimately receive DVD release. Neil has also recorded a piano accompaniment for the 1925 Charlie Chaplin classic The Gold Rush released on DVD by French TV company MK2, along with the 1934 reissue with Chaplin’s own score. Neil’s score uses melodies from the compilation conductor's score of that first performance..
Neil’s new jazz score for E A Dupont’s Piccadilly was featured in a sell-out performance at the 2000 seat Barbican Concert Hall to great acclaim, (described by Phillip French in the Observer as ‘the cinemagoing event of the year’) and was performed live in the Piazza Maggiore, Bologna in July. It has now been released as a BFI DVD..
Neil has scored Paul Leni’s The Cat and the Canary for Photoplay Productions. This spooky house comedy-horror is scored for 12 musicians including Theremin, conducted by maestro Timothy Brock, and received rave reviews as the closing event of the Pordenone Silent Film Festival in October 2004. It has played on Film Four, will play on ARTE and in the States and will eventually be released on DVD..
His radio play, STAN, about Stan Laurel’s last meeting with stroke victim Oliver Hardy, went out on Radio 4 at 2.15, Friday July 30th 2004, starring Tom Courtenay as Stan Laurel. It was received with great critical acclaim, being Pick of the Day in most broadsheets as well as the Radio Times and featuring prominently on BBC Radio 4’s ‘Pick of the Week’ and ‘Feedback’. See the STAN page on this website. Subsequently nominated for the Sony radio awards. Neil appeared in the BBC2 series ‘Who Do You Think You Are’ in the episode featuring soprano Lesley Garrett’s search for her roots, particularly her grandfather, Colin Wall, who was a silent film musician in Rotherham. He has also done a day’s filming as a movie pianist for Ken Loach’s film, The Wind the Shakes the Barley.